Please join us Friday, June 22, for a special Friday Night Zen program with Gesshin Claire Greenwood. 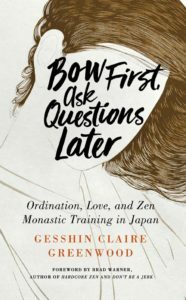 In this evening’s program Gesshin will be reading from her book Bow First, Ask Questions Later: Ordination, Love, and Monastic Zen in Japan and discussing gender, renunciation, and boundaries in the spiritual path. Gesshin Claire Greenwood was a liberal, free-spirited American girl who found meaning and freedom in disciplined, traditional Japanese Zen life. However, she came to question not only contemporary American values but also traditional monastic ones. This book is about becoming an adult—about sexuality, religion, work, ethics, and individuality—but it is also about being a human being trying to be happy. Questioning is a theme that runs throughout the book: how can I be happy? What is true? What is authentic? The program will start at 7 p.m. with a 20 minute meditation period and will include book reading and discussion at 7:30 p.m. and book signing and tea time at 8:30 p.m. Please arrive by 6:45 p.m. in order to be settled before the meditation period begins. Friday Night Zen is a space for aspiring and seasoned meditators alike to connect and explore how meditation and mindfulness relate to daily urban living. Through meditation, group readings, and discussion, we investigate and uncover the habits that keep us from fully experiencing our lives. The group is geared toward ages 25 to 40, but all are welcome. No previous experience is required! Please see the Friday Night Zen program page for upcoming meeting dates. Gesshin has been practicing Vipassana and Zen for over 12 years. An ordained Zen priest, she spent five years in Japan practicing, studying, and teaching, including three years at Aichi Nisodo, a Soto Zen convent led by Aoyama Roshi. 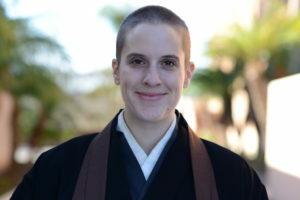 She received dharma transmission from Seido Suzuki Roshi in 2015 and holds a master’s in East Asian studies from the University of Southern California. With James Ford Roshi, she leads retreats at Blue Cliff Zen Sangha in Orange County.